Zappos - Eric D. Brown, D.Sc. I picked up Delivering Happiness: A Path to Profits, Passion, and Purpose by Tony Hsieh through the Amazon Vine program (love that program…free stuff to review!). I’m a big fan of Zappos and the things that the company has been able to do. I love the idea of a culture driven company and Zappos has been the poster child for this idea for quite some time. When I saw this book, I knew I had to read it. The first section of the book covers a great deal of time (birth to Tony’s start as Zappos’ CEO). Tony provides provides a pretty interesting, and at times funny, walk-through of his childhood, high school and college. While describing his life, its easy to see the entrepreneurial spirit alive and kicking throughout Tony’s life. One of the really interesting parts of this section is the description of the building of Tony’s first company LinkExchange (LE) and the subsequent selling of that company to Microsoft. The building and sale of LinkExchange isn’t chronicled in detail but an interesting summary is provided the gives the reader a good feel for what happened. In addition, Tony describes the years after the LE sale and his search for something to do. In this part of the book, Tony details the lessons he learned playing poker…and tries to equate them to strategies for business…and he does a pretty decent job of it too. About half-way through the book (starting with Section II) Tony gets into the details of how Zappos became the company it is today. The trials & tribulations of an internet company trying to survive the bursting of the dot.com bubble, the economic troubles of the early 2000’s and other issues (9/11, etc). 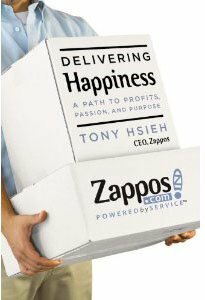 This part of the book is pretty interesting as Tony gives the reader some insight into how Zappos was kept afloat during the initial few years. Basically, if it weren’t for Tony putting his own money into the company (and almost going broke doing so) Zappos might not have survived. While describing how Zappos was built into a thriving business, Tony also provides some insight into his approach to building the Zappos culture that we’ve all become aware of. There are some great tidbits of knowledge in this section of the book. While I found the first two sections of the book (described above) interesting, the final section of the book is where the real lessons can be learned about building a culture that fits an organization. In the final section of the book, Tony describes the concept of Delivering Happiness. This section is very interesting and worth reading a few times (which I’m doing). This book is a winner. I like this book for a few reasons. First, its just an interesting read. Being able to hear about Tony’s life from Tony is interesting to me. Second….it provides some excellent insight into what its really like running a startup and the ups/downs that comes with the territory. If you have any interest in building a business, read this book. If you have any interest in a building a culture that ‘fits’ your organization, read this book. If you like reading about success stories in business, read this book. Buy this book when it comes out…great read and some excellent insights. Can an organization be built on individuality with a focus on bringing humanity back to business? The modern day corporation was developed to build ‘stuff’. To build ‘stuff’, organization was needed. To keep the organization flowing, management was needed. Management created processes, procedures, flowcharts, operational efficiencies, human resources, etc etc etc. Many of these things are necessary to manage production. To build a car, you have to have an assembly line that is run by processes. These operational processes were built to take the humanity away from production. Processes are built to force compliance into an agreed to standard of doing things. Processes kill individuality. This isn’t necessarily a bad thing on the production line or in mission critical areas. You wouldn’t want an airline pilot to be flying be the seat of her pants…you want to feel comfortable in the knowledge that they are following a set of procedures. Processes are a good thing for an airline pilot…but what about someone trying to work in Customer Service or in the marketing team of an organization? This operational mindset fails when you move into other areas of business. The people facing areas require a much more humanity driven approach. In these areas, people should be allowed to be people. Employees should be allowed to speak with their own voice and use their given talents. Look at Zappos as an example. Their Customer service reps have the authority to do whatever it takes to make the client happy. The service reps don’t read from a script or follow a process…they help their customers. They have the authority to recommend their comeptitors if needed. I’ve even hear that they can buy from their competitors and have the order shipped overnight to the client just to keep them happy. What does Zappos management tell their reps? “Use your best judgement“. Zappos allows their employees to be themselves and USE THEIR JUDGEMENT. That’s what I mean about bringing humanity back into business. Zappos used this approach to reach $1 billion per year in revenue. That’s BILLION. They’ve gone from zero to $1 Billion in less than 10 years. What are the other shoe companies doing? Building processes. Building operational efficiencies. etc. etc. We’ve always drawn lines between business and personal. We’ve been told not to cross the streams, that business and personal are expressed in different languages somehow, and as marketers, we sure as hell developed a vocabulary all our own for the “business” application (often whether or not anyone was speaking that way). Zappos has kept things human and so have a few other companies that understand the power of letting their folks be themselves. By telling their employees to ‘use their best judgement’, Zappos is letting their employees wing it. Winging it makes businesses especially uncomfortable. We have strategic plans, business plans, processes, flowcharts, and procedures all designed to make sure we color inside the lines. That we reduce the variables and mitigate the unexpected. Exactly. Businesses have built processes to mitigate risk. But these same processes mitigate humanity as well. They kill individuality. Perhaps you’re calling me a knucklehead right now…I am….but that’s beside the point. Processes are OK. Processes are good for certain parts of a business. Just don’t kill individuality by processing it out of your employees. The only real advantage organizations have today is their people. Technology and processes can be mimicked…people can’t. If you hire the right people and let them loose to do what they do best, you can bring humanity back to your business. Give your team some ability to wing it and you’ll see how much they’ll surprise you. They may even stick around after the recession is over if they feel valued and trusted enough….but that’s a post for another day.